John 17:15 Are You Protected? Author LCPublished on February 13, 2013 Leave a comment on John 17:15 Are You Protected? I love to go to Christian conferences, partly because I love to learn and to see things from fresh perspectives, but I also love to meet new people who are already sisters and brothers in Christ. Even if our opinions on some matters differ, we are all on pretty much the same wavelength. Our beliefs are similar enough that even though we may have never met before, we are like family. Being with them gives me encouragement in my faith, knowing I am not alone. That is not true for us in every environment we enter, and it was not at all the reality for Jesus’ disciples. There were such a small number of people who were followers of Christ while He walked the earth, and so many more who followed the religious leaders of the day or who were heathens, that the disciples faced a lot of doubt, criticism and persecution. Before Jesus was arrested and crucified, He prayed for His disciples. Jesus knew that because His disciples had believed in Him, the world would hate them. So Jesus prayed that the Heavenly Father would protect them. John 17:15 tells us that Jesus did not ask God to protect them by taking them out of the world, but that He would protect them while they stayed in the world. That did not mean that the disciples would not face physical harm or discomfort. We know that they did, but Jesus' prayer was that their souls would be protected from Satan for eternity. Jesus had a purpose for His disciples to be in the world and not isolated from it. He wanted them to represent Him and His Word to those around them. He wanted them to spread His love, joy, grace and truth to others. That purpose and Jesus’ prayer still apply to us today. John 17:20 includes us if we believe in Him. I think sometimes we expect that if we follow Christ our lives should be comfortable and full of blessings, and so we are always disappointed or frustrated when the opposite happens. We should not expect life to be easy, but we can expect God to give us the strength we need to face it. Are you being criticized by others for your beliefs? Do those people represent Jesus or the world? If they represent the world, do not try to win their approval. Instead, represent Jesus in a way that will glorify God, and trust Him to protect you from the evil one. Published on February 13, 2013 Categories Faith, TrialsTags encouragement, faith, John, living, persecution, truthLeave a comment on John 17:15 Are You Protected? Luke 16:10 Hilarious High School Bloopers? Author LCPublished on October 31, 2012 Leave a comment on Luke 16:10 Hilarious High School Bloopers? Today's post was written by Rusty Wright with Meg Korpi. I laughed so hard, I ached. A while back, a friend e-mailed me a list of “Worst analogies written by high school students.” I began using them when presenting at writers and editors conferences. They were genuine side splitters, an English teacher’s nightmare. Recently, I decided to track down these shaky analogies’ original source. Turns out they weren’t culled from high school classrooms, but rather were published entries from The Style Invitational, a Washington Post humor writing contest. Apparently, Internet rumors morphed them into high school bloopers. You see, not only am I a stickler for accuracy, but people who spread Internet rumors without checking the facts really irk me. Countless times, I’ve encouraged correspondents to fact check on Snopes.com or TruthOrFiction.com, valuable, if imperfect, resources. I should have checked these analogies before repeating them. “Physician, heal yourself!” you might say. Guilty as charged. “Any story sounds true,” notes a Jewish proverb, “until someone sets the record straight.” Lesson learned. The Internet can be a 21st-Century backyard fence or office water cooler. One click can spread interesting, funny, engaging, or juicy gems. Problem is, too often the dispatches contain cyberfactoids—my wife Meg’s coinage for unsubstantiated or inaccurate information, propagated as fact via the Internet. And many will believe these tidbits. After all, they came from a trusted friend. So where’s the harm in conveying a little imperfect information? These analogies are just for fun—and they do seem funnier coming from unwitting high-schoolers, rather than contestants intentionally writing “good” bad analogies. Shouldn’t we just lighten up? If you’re the “trusted friend,” it may depend on whether you want to be, in fact, trustworthy. In fact, carelessness with the truth can blow up on you. Just ask those who ignored problems at BP’s Macondo oil well in the Gulf of Mexico. Sorry, Joe. I really am. Hope this helps set the record straight. Meg Korpi is a senior research scientist who studies character development and ethical decision-making through the Character Research Institute in Northern California. She holds a PhD in Educational Psychology from, and formerly taught at, Stanford University. Published on October 31, 2012 Categories TruthTags accuracy, Internet, Luke, trustworthy, truthLeave a comment on Luke 16:10 Hilarious High School Bloopers? I Corinthians 15:3-6 Jesus’ Resurrection: Fact or Fiction? Author LCPublished on April 9, 2012 Leave a comment on I Corinthians 15:3-6 Jesus’ Resurrection: Fact or Fiction? Countless scholars--among them the apostle Paul, Augustine, Sir Isaac Newton and C.S. Lewis--believed in the resurrection. We need not fear committing intellectual suicide by believing it also. Where do the facts lead? 2. The Disciples' changed lives. After Jesus' arrest and crucifixion, most of the Disciples fled in fear. Peter denied three times that he was a follower of Jesus. (The women were braver and stayed to the end.) Yet ten out of the eleven Disciples (Judas committed suicide) were martyred for their faith. According to traditions, Peter was crucified upside down; Thomas was skewered; John was boiled in oil but survived. What turned these cowards into heroes? Each believed he had seen Jesus alive again. 3. The empty tomb. Jesus' corpse was removed from the cross, wrapped like a mummy and placed in a solid-rock tomb. A one-and-a-half to two-ton stone was rolled into a slightly depressed groove to seal the tomb's entrance. A "Green Beret"-like unit of Roman soldiers guarded the grave. Sunday morning, the stone was found rolled away, the body was gone but the graveclothes were still in place. What happened? Did Christ's friends steal the body? Perhaps one of the women sweet-talked (karate-chopped?) the guards while the others moved the stone and tiptoed off with the body. Or maybe Peter (remember his bravery) or Thomas (Doubting Thomas) overpowered the guards, stole the body, then fabricated--and died for--a resurrection myth. Did Christ's enemies steal the body? If Romans or Jewish religious leaders had the body, surely they would have exposed it publicly and Christianity would have died out. They didn't, and it didn't. The "Swoon Theory" supposes that Jesus didn't really die but was only unconscious. The expert Roman executioners merely thought he was dead. After a few days in the tomb without food or medicine, the cool air revived him. He burst from the 100 pounds of graveclothes, rolled away the stone with his nail-pierced hands, scared the daylights out of the Roman soldiers, walked miles on wounded feet and convinced his Disciples he'd been raised from the dead. This one is harder to believe than the resurrection itself. 4. The appearances of the risen Christ. For 40 days after his death, many different people said they saw Jesus alive. Witnesses included a woman, a shrewd tax collector, several fishermen and over 500 people at once. These claims provide further eyewitness testimony for the resurrection. The above does not constitute an exhaustive proof, rather a reasoned examination of the evidence. Each interested person should evaluate the evidence and decide if it makes sense. Of course, the truth or falsity of the resurrection is a matter of historical fact and is not dependent on anyone's belief. If the facts support the claim, one can conclude that he arose. In any case, mere intellectual assent to the facts does little for one's life. Published on April 9, 2012 Categories TruthTags Easter, evidence, facts, I Corinthians, resurrection, truthLeave a comment on I Corinthians 15:3-6 Jesus’ Resurrection: Fact or Fiction? In my last post I discussed how sometimes Christians can be judgemental, but Christians are judged a lot too. One judgement that is often made is that we must be mindless to believe in a God we cannot see. Yet there are people who have suffered persecution, even given their lives rather than deny their belief in God. Why would the disciples have kept the faith when their lives were at risk? Why would people today? They would have to be pretty certain that what they believe is true to be willing to give up their lives for it. One of the verses that I mentioned in my last post was I Peter 3:15-16. Always be ready to give an answer for the hope that you have. Be ready to explain why you believe as you do. In order to do that you have to know for yourself, and the fact that your parents or your friends believe that way won’t hold up as a reason for long. In Acts 17:10, Luke is in the process of recounting the travels and activities of Paul and Silas among others. They had been in Thessalonica (Acts 17:1-9) but had to leave because the Jews there didn’t want to consider anything different than what they already believed, so they were not willing to hear that Jesus was the Messiah that they had been waiting for. They opposed Paul and Silas and accused them of stirring up trouble and opposing Caesar. These were pretty serious charges, so after paying their fine, the believers sent Paul and Silas to the town of Berea. As usual Paul went to the synagogue to share the good news that Jesus was the Messiah. The Bereans heard the message, but instead of opposing it, they listened with open minds to hear what Paul had to say. They also took the next step. 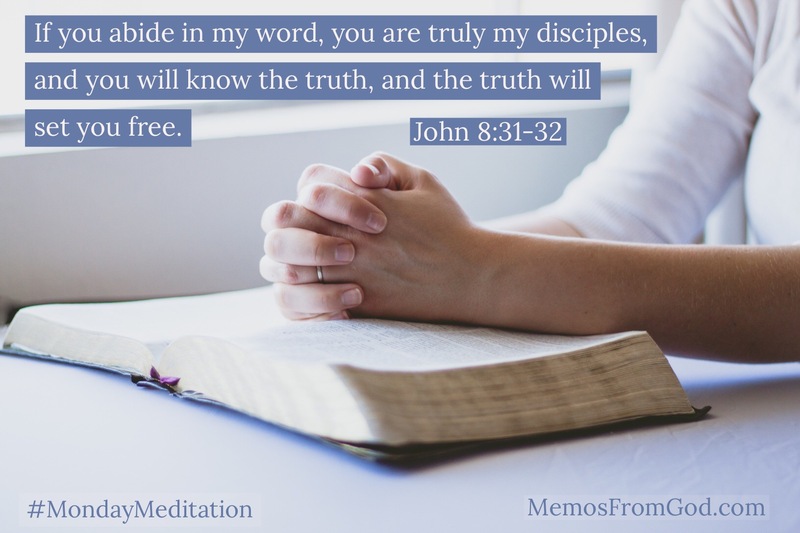 They didn’t just take what Paul said at face value; they searched the Scriptures and studied them every day to see if what Paul was saying was true. (Acts 17:11) Many translations describe the Bereans as being noble or fair-minded. Essentially, they were more willing to learn, by listening to Paul and then checking the facts for themselves. Are you unsure what to believe? Don’t believe anything just because someone else tells you to. Think for yourselves. Do your research. The Bible can withstand your scrutiny. Do a little bit of studying. One example of a person who did this is Josh McDowell. He was a skeptic that set out to prove Christianity was a joke. He couldn’t do it because there was far too much evidence to prove that Jesus is who He says He is. You can read Josh’s account of his own journey in the third section of Skeptics Who Demanded a Verdict, available as a PDF here. Other resources he has available may help you in your own search for the truth. I often read other people’s blogs and comments. One comment I read recently was on the topic of food laws of the Old Testament, and if we weren’t willing to obey them, should we just ignore all the other laws of the Old Testament, such as the ten commandments, as well? I’ve heard comments similar to this before. If this was a cultural issue and doesn’t apply to us today, then does any of the Old Testament apply? I find it interesting that (a) people think that it has to be all or nothing and (b) people are willing to follow the rules without understanding the underlying principles. This is what the Pharisees did. The disciples had grown up with these Pharisaical traditions, and didn’t know any other way. So when Jesus said that people could not be defiled by what they ate, the disciples were confused and asked for an explanation. (Mark 7:17-23) I’m sure that Jesus did not intend for us to never wash or to eat anything we wanted without regard to our health. But He was more concerned with our spiritual health than with our physical health. He was more concerned with the condition of our hearts, because that is the source of sin in our lives. If we will concentrate on keeping our hearts pure, our hands and mouths will not do anything to defile us. In honour of Ephesians week, I am reposting an entry that I shared with you a couple of months ago. Some of you may have missed it, and some of you may be encouraged by reading this again.